City palace is one of the most famous places in Pink city. At the City Palace, the royal family lived for many decades. It shows the royal architecture and the traditions of the royal families. It is one of the most visited tourist’s spots in Jaipur as it is located in the heart of old city of Jaipur and covers around one-seventh area of the whole city. The city palace shows a fusion of Mughal and the Rajasthan tradition. The courtyards, gardens and buildings are embedded with marbles and these changed were done by Raja Jai Singh successors, which add more beauty to the existing dignity of the palace. Ridhi pol is in Chandra Mahal which has four gates in the inner courtyard. This is the main palace which imposes the traditional Rajasthan in it and also comprises of Mughal architecture. 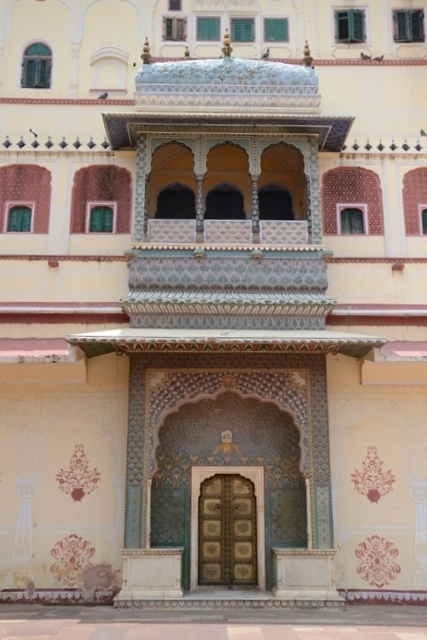 Chandra Mahal is the place where the present Raja of the Jaipur resides. That’s why only the ground floor is allowed for visiting. It has various gardens in it. This palace has various collections in it like floral decorations, lovely paintings, mirrored walls and highly decorated ceilings. The four gates are decorated with themes representing the four seasons. The gates are Peacock gate, Lotus gate, Green gate and Rose gate. Lotus Gate is with continual flower and petal pattern suggestive of summer season; the Green Gate, is also known as the Leheriya gate which means waves, in green color suggestive of spring, and lastly, the Rose Gate with repeated flower pattern which shows winter season and dedicated to Goddess Devi. Rose gate is one of the most famous of the four gates which are depicting seasons, which are leading towards Pritam Niwas Chowk, which symbolizes the winter season in it. This gate gives dedication to the Goddess Devi. This gate is located in the Northern Eastern side of the courtyard. This gate is in third number in the series of the four gates of from Ridhi Sidhi Pol. Each gate of the Ridhi Sidhi Pol gives us the spiritual connection, which signifies the trust of public on their region. This gives the essence of life of the medieval period in India. This gate is one of the good examples of attraction to show the lives of Rajputs in every situation and also in a detailed way. Beautifully designed and painted the rose petals act as sentries at the main gate and them surround the statue of God which is made in between the lotus petals and is beautifully decorated by cloth screens.